Moist hardwoods (including moist spots or trails in beech-maple forests), but more often in swamps (especially cedar) and bogs, often along streams, sometimes on mossy logs; alder thickets, wet meadows, shores. The flowers may be quite large (to 25 mm long). Albinos are occasionally found (f. albiflora Britton). The sepals are frequently ciliate and the auricles are often very prominent. 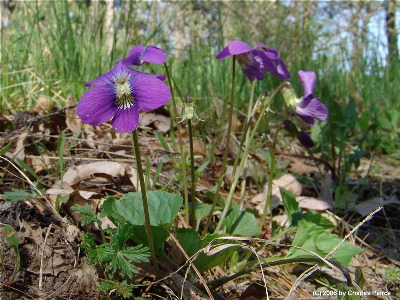 Rarely there are a few hairs on the spurred petal, but large auricles will help to distinguish such plants from other species, if they are not hybrids. Some specimens approach V. sororia and others V. affinis or V. nephrophylla. MICHIGAN FLORA ONLINE. A. A. Reznicek, E. G. Voss, & B. S. Walters. February 2011. University of Michigan. Web. 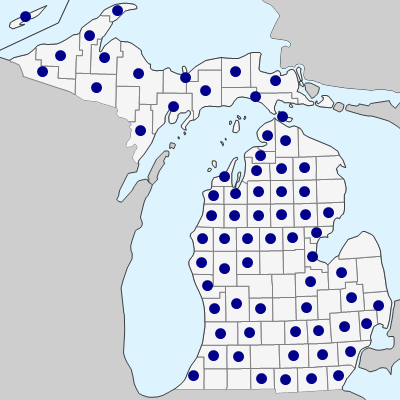 April 19, 2019. https://michiganflora.net/species.aspx?id=2782.